1722 - EDWARD WINSLOW was born 8 Nov 1722 in Boston, the oldest son of Joshua Winslow (12 Feb 1695- 9 Oct 1769) (Joshua was baptized in the Anglican Old North Church 17 Feb 1695 had a distil house on Cold Lane, now Portland Street) a merchant and Justice of the Peace; and Elizabeth Savage (29 Sep 1704 – 7 Aug 1778). Edward is the grandson of Elizabeth Hutchinson (1639-1728) and Edward Winslow (1634-1682), silversmith; great grandson Mary Chilton (1593-1679) and John Winslow (1597-1674). 1724 - Samuel Johnson (14 October 1696 – 6 January 1772) begins at Christ Church, Stratford, CT. Johnson, doubted his Congregational ordination and left the colony in order to seek ordination in the Church of England. Upon his return to Connecticut, he opened the first Anglican church in the colony at Stratford in 1724 and strenuously polemicized, under the auspices of the Society for the Propagation of the Gospel in Foreign Parts, against both the Congregationalists of New England and the new evangelical outburst occasioned by popular preacher George Whitefield and the Great Awakening he unleashed. 1739 - Edward Winslow entered Harvard (16 yrs old). Edward Holyoke was serving as Harvard President - Holyoke's presidency was not without some controversy. In the early 1740s, the revivalist George Whitefield came to Cambridge to preach. Although Holyoke at first welcomed Whitefield to Harvard College, he eventually turned against him because Holyoke perceived Whitefield's religious views as excessive, inspiring division among families and local churches. Moreover, Holyoke took exception to Whitefield's labeling of Harvard College as a house of impiety and sin. 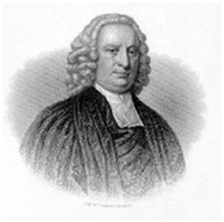 In 1744, Holyoke and other members of the faculty defended the college and warned the local churches against Whitefield's views in The Testimony of the President, Professors, Tutors and Hebrew Instructor of Harvard College, Cambridge, Against the Reverend Mr. George Whitefield, And His Conduct. This rebuttal to Whitefield sparked a yearlong pamphlet war between both sides. Despite Holyoke's differences with George Whitefield, when a fire destroyed the College's original library twenty years later in 1764, Whitefield came to the College's aid and donated books and money to help rebuild the library collection. 1741 - Harvard: B.A. 1741, class rank 5/28?. “When a Senior he brought on a cause celebre by refusing to surrender a Freshman* who was fagging for [serving] him to run a errand for Tutor Mayhew. After much ado the Faculty informed him that ‘it was ill Manners to ask a Tutor to release a Freshman to him and that he (Winslow) ought to have look'd for another’. The President also ‘Chode Winslow for presuming to Appeal from Mr. Mayhew to Mr. Prince.’” He was chosen for valedictory and Commencement salutatory oration. For M.A. 1744, granted in absentia, he was prepared to hold affirmative of An Homines virtute praediti, quocunq; modo, nisi amore sui et commodi privati desiderio, ad virtutem, stimulentur? “Adams entered Harvard at fifteen,” says John Patrick Diggins’s short biography, John Adams. That sounds mighty impressive from our perspective, when a typical college freshman is eighteen. But fifteen was slightly on the late side in the mid-1700s. With the benefit of a Boston education, John Hancock started college at thirteen, and there was an even younger student in his incoming class. In the 1700s, ordinary schooling for Boston boys ran from about age seven to age thirteen or fourteen, if they lasted through the whole course. Therefore, the few boys who went on to college were still truly boys, only in their early teens. Usually they graduated college at eighteen, still years away from their legal majority. 1. No Freshman shall wear his hat in the College yard, except it rains, hails, or snows, he be on horseback, or hath both hands full. 2. No Freshman shall pass by his Senior, without pulling his hat off. 3. No Freshman shall be saucy to his Senior, or speak to him with his hat on. 4. No Freshman shall laugh in his Senior’s face. 5. No Freshman shall ask his Senior any impertinent question. 6, No Freshman shall intrude into his Senior’s company. 7. Freshmen are to take notice that a Senior Sophister can take a Freshman from a Sophimore, a Master from a Senior Sophister, and a Fellow from a Master. 8. When a Freshman is sent of an errand, he shall not loiter by the way, but shall make haste, and give a direct answer if asked who he is going for. 9. No Freshman shall tell who he is a going for (unless asked), or what he is a going for, unless asked by a Fellow. 10. No Freshman, when he is going of errands, shall go away, except he be dismissed, which is known by saying, “It is well,” “You may go,” “I thank you,” or the like. 11. Freshman are to find the rest of the scholars with bats, balls, and footballs. 12. Freshmen shall pay three shillings to the Butler to have their names set up in the Buttery. 13. No Freshman shall wear his hat in his Senior’s chambers, nor in his own if his Senior be there. 14. When anybody knocks at a Freshman’s door, he shall not ask who is there, but immediately open the door. 15. When a Freshman knocks at his Senior’s door, he shall tell his name immediately. 16. No Freshman shall call his classmate by the name of Freshman. 17. No Freshman shall call up or down, to or from his Senior’s chamber or his own. 18. No Freshman shall call or throw anything across the College yard, nor go into the Fellows’ Cuz-John. 19. No Freshman shall mingo against the College walls. 20. Freshmen are to carry themselves, in all respects, as to be in no wise saucy to their Seniors. 21. Whatsoever Freshman shall break any of these customs, he shall be severely punished. “Cuz-John,” short for “Cousin John,” was a euphemism for the privy. According to the wonderful World Wide Words website, a set of rules for Harvard boys written down by a member of the class of 1738 is the earliest recorded use of the word “john” in this particular context. And “mingo”? That’s what boys can do while standing up in a cuz-john. Prof. Diggins has been participating with Steven Waldman, Alan Taylor, and screenwriter-producer Kirk Ellis in a lengthy discussion of the H.B.O. miniseries John Adams on The New Republic’s website. Will dated 10 Oct. 1744 of Abel Alleyne, Edward Winslow future father-in-law, of the Parish of St. John, Barbados. To be buried in the vault in St. James Church as near my father as possible. I give to the best of women and most affectionate wife and tenderest parent Mary Alleyne (Woodbridge) all my plate, jewels, etc. whatever money I have by me at my death or what is owing me then. Profits on my estate called Mount Steadfast, Barbados, to be divided among children after paying wife’s marriage settlement of £400 per annum. Wife and children to have accommodation in dwelling house at Mount Standfast. . . .
1745 - Edward Winslow conformed to the Church of England and desired to take Anglican orders. When his Congregationalist father opposed this desire, he married in Barbados Jane Isabella Alleyne of St. Phillips, Barbados, daughter of Abel Alleyne and Mary Woodbridge, 16 July 1745 at the Mansion House of the Society’s Plantation by Rev. 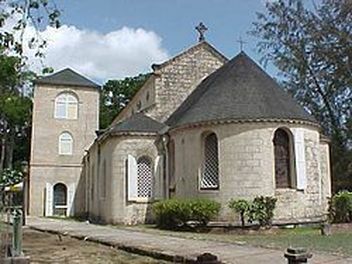 Dudley Woodbridge and became a merchant in Barbados. This experience strengthened his call to be a priest. He continued his classical studies. 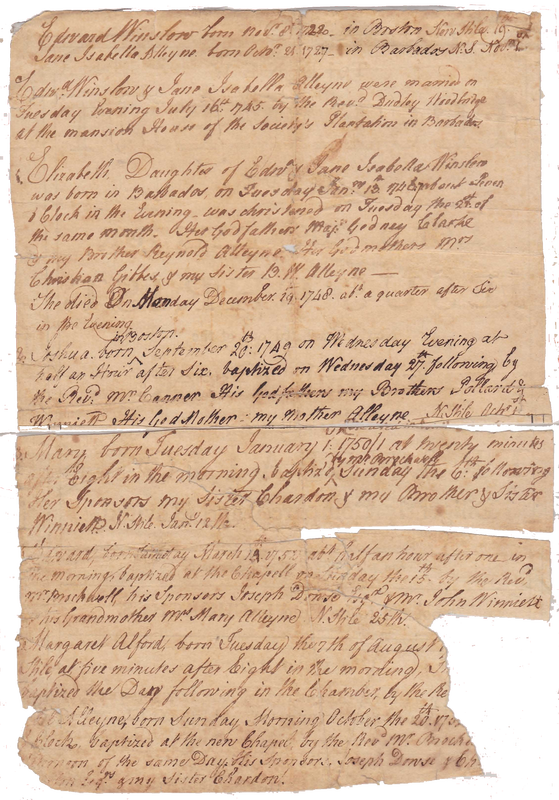 1746, April 9– He writes from Barbados to his younger brother Isaac a letter of introduction for Abel and Mary Woodbridge Alleyne, his father and mother-in-law, who are about to move to Boston because of Abel’s health. the Rector, The Rev. Henry Barclay in his parochial duties. 1752 - Edward Winslow is born 19 Mar 1752 Boston, MA. He moved to North Carolina and is shot by Indians in 1787. 1753 - Margaret Alford Winslow is born 7 Aug 1753 Boston, MA. She will marry on 9 Jun 1778 Col. Charles Handfield of British Army in Newport R.I.
arriving home. Entries during the voyage from Boston to London consist mainly of meteorological and navigational observations. Authorship of the diary is assigned from information in the text concerning his ordination and appointment to Stratford. At Fayetteville, JOHN WINSLOW, Esq. President of the Bank of Cape-Fear, at that place. —Published in Carolina Centinel (New Bern, North Carolina), Saturday, December 9, 1820, p. 3.